Tyne Valley Big Band | Big Band, Big Sound! Pre Easter Phoenix Nite and TVBB Curry went down a storm last night. Great performances from the Tyne Valley Jazz Ensemble and Tyne Valley Youth Big Band. Thank you for the kind donations to the Mark Jon Bolderson Foundation who continue to keep Marks memory alive with the fantastic opportunities they are giving to young percussionists. As always a great day out for the band in Sunderland/Chester le Street. We got some lovely feedback from the audience and adjudicators. A new location this year saw us playing next to a man with performing sheep. (He was from Devon). TVBB, dancing sheep, traction engines & BEER from our sponsors Wylam Brewery, whats not to like? We dug out all our classic Big Band dance numbers to play at this charity event. David in one of his first TVBB gigs and a great asset to the band. It was a privilege to be invited by Amanda Bolderson to play at the Queens Hall to raise money for the ‘Mark Bolderson Foundation’s set up in memory of her brother Mark. This joint gig with the Tyne Valley Junior Jazz Ensemble and the Tyne Valley Youth Big Band was hosted by local comedy star Steffan Peddie, AKA big Keith in Hebburn, who entertained us all. TVBB had the honour of playing with two of the regions top trumpeters, Mark Webb and Darren Irwin who joined us in honour of Mark. Mask is sadly missed by us all. In March he was finally laid to rest by his family and friends in a moving boat trip on the Tyne, his ashes being scattered opposite the Sage, a place he loved. Friend and fellow percussionist Jack Ruddick donated one of his drum sticks to be floated down the Tyne with Marks ashes. RIP Mark. Many thanks for our friends at Bebop Spoken Here for such a great review of last nights Gig. We had a hoot! Modest one-room pub + big band = a fun night out. Arriving at the Fox, Hexham Jazz Club’s HQ, it appeared a furniture removals business was in the process of clearing the place. Hang on…it’s the band rearranging the room! 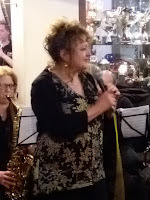 The pub’s usual bay window stage area would become front row seats for the evening as the regular seating was requisitioned by the band, that’s the twenty three-strong Tyne Valley Big Band. The TVBB is a super-sized big band varying in number from one gig to the next. This Hexham Jazz Club engagement mustered a mere nine reeds (of which seven were female! ), a paltry six trumpets (five in the section, MD Dave Hignett out front) and, had space permitted, there would have been a keyboard player working alongside the band’s rhythm section. The Pink Panther for starters, a tune the pub’s resident non-jazz fan (stationed at the bar) sheepishly conceded was a canny tune. Dave Hignett suggested he may not like the rest of the evening! In the Mood (arr. Doc Severinsen) with a flurry of soloists including Andrea de Vere on tenor and Kelly Rose, alto. Ray Charles’ Hallelujah I Love Her So, featuring a trombone blast from Simon Hirst (heard recently with the Bold Big Band), could have been any old internet download arrangement but not this one. MD Hignett made use of an invaluable regional resource to challenge and stretch the band by playing an arrangement by a well-loved bandleader, composer and arranger, the late Ray Chester. The Chester family donated Mr Chester’s vast library of arrangements to Sage Gateshead with the express intention that it was to be made available for occasions such as this at the Fox. Band singer Barbara Hignett made a first appearance singing Route 66 then Sway (the audience did, sway that is). Uptown Funk (Mark Ronson, Bruno Mars) went global and the TVBB plays the number with gusto. The band is nothing if not prepared to turn its hand to anything. From Ronson to Sammy Nestico’s Feelin’ Free featuring the muted trumpet section and You Gotta Try. Alto saxophonist Sophie Speed was Feelin’ the Funk as were Hignett, Kevin Moore, guitar, and a riffing band. Becky White emerged from the reeds to shine on Birdland , Barbara Hignett returned to tell us it was a Hexham Winter Wonderland which brought a close to the evening, except for a poignant finale. Earlier this year the Tyne Valley Big Band lost a friend and fine drummer when, at the age of 45, Mark Bolderson died. Mark suggested to Dave Hignett the band should play Gospel. They did, Mark got to play it, and this evening’s concert ended with the band playing it. On Dec 9th (Saturday) in Queen’s Hall, Hexham, the Tyne Valley Big Band will be taking part along with many others, including the Tyne Valley Youth Big Band and the Tyne Valley Jazz Ensemble, in a concert to help raise funds for the Mark Jon Bolderson Percussion Foundation. Tickets are available from the Queen’s Hall – telephone 01434 652477. We ended the summer gigs with a joint night of Jazz with our Junior and Youth bands in our spiritual home ‘The Phoenix’ who provide us with a great space to rehearse every week. Jazz is thriving in Hexham under Dave Hignetts direction with some enthusiastic performances from the Tyne Valley Junior Jazz Ensemble and Tyne Valley Youth Big Band. TVBB ending the set before a quick getaway to ‘The Valley’ for the now traditional curry and handing over of the Whisky to our MD Dave Hignett.